Jungle Red Writers: "Oh, Kaye!" - Who Do You Love? Thankfully, there are plenty enough books still out there that I haven't discovered yet, along with all the new books being released every day, that I'll never be lacking for new reading material. There are some series that have come to an end that I mourn. One I mourned long (and loudly) was Margaret Maron's Sigrid Harald series. 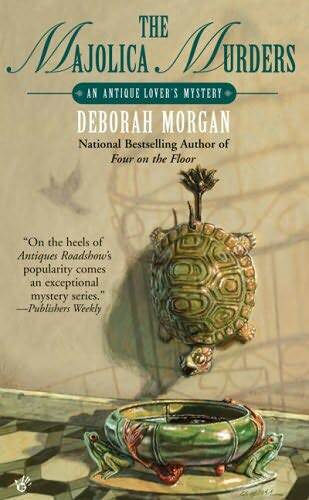 I'll be forever grateful to Margaret for having Sigrid and Deborah meet. What a treat to have two much loved characters meet and visit in one another's home settings. (see there, dreams do come true!). and I often wonder what Archie and Nero Wolfe are up to. And, how things might be with Pierre Chambrun at the Hotel Beaumont. And what kinds of sandwiches Sgt. Edward Delaney has concocted during the last several years . . .
oh, Laws, don't even get me started on Harry Potter! 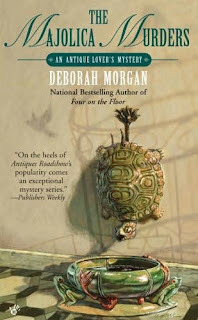 I miss Dorothy Gilman's Mrs. Pollifax and Virginia Lanier's bloodhound series. But since you introduced me to Sharon Wildwind's series, and I'm missing that too, it's lucky you've mentioned some series I haven't read yet. Thank you Kaye! I phrased that wrong. Sigrid and Henry O are special favorites too, it's just that I might have missed Sharon Wildwind if not for your recommendation. With so many wonderful books creating huge to-be-read mountains, I’m much more likely to be missing a series because it’s a long wait for the next book. [Right now I am counting the days until Julia’s “Through the Evil Days” is released --- it’s 121.] I don’t mind so much that some series have come to their inevitable end . . . after all, it’s been wonderful sharing their adventures, but there always seems to be a new series to follow . . . . I miss Harry, Hermione and Ron. Okay I miss Snape too. And I'm very relieved that Three Pines will be open for murder again. Enough traipsing around the countryside and hanging out with monks! Spenser I wonder about. Is it really Spencer? What a good question Kaye! I miss Deborah Donnelly's wedding planner mysteries. And also, Hallie's Dr. Peter Zak:). And John D. Macdonald. And Abigail Padgett. and Sujata Massey's half Japanese character. Recently Resuscitated by ebooks here. Yay! TFA misses Travis McGee, too, Roberta. Going back now, they aren't quite as good as he remembers, but he loved Travis' comebacks and comments, not to mention the big action finish MacDonald always provided. His work has always been a major inspiration. I'm with you, Kaye. I miss Nero Wolfe and Archie Goodwin. And, I miss Robert B. Parker's Spenser, not the new one. I miss Harry Potter and Hogwarts. But, I think the one I miss most of all is Dorothy Simpson's Luke Thanet. I have great news for you. 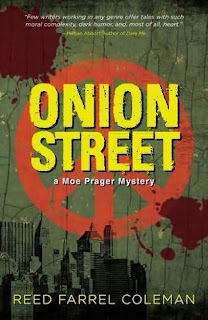 There is still one more book to come in Reed Farrel Coleman's outstanding (and award winning) Moe Prager series. THE HOLLOW GIRL will be out next year. I will then mourn the end of Moe and his many adventures as a ex-cop PI, but I am also grateful that the series was abundant and never flagged. I urge all JR-ers to try Reed's work if you haven't before. And the most recent book (that you posted the cover for) ONION STREET is a good place to start as it goes back to Moe's beginning story. Otherwise start at the beginning and read them in order for maximum satisfaction. Thanks. Anne George's Southern Sisters series. Mouse and Sister--oh, how I wish we could share more adventures. What a nice post, Kaye! We've had more than a few series by Reds come to their ends. I get email all the time: Are there more Dr. Peter Zak novels anytime soon? (Answer: Don't hold your breath!) For me, moving on was all good. 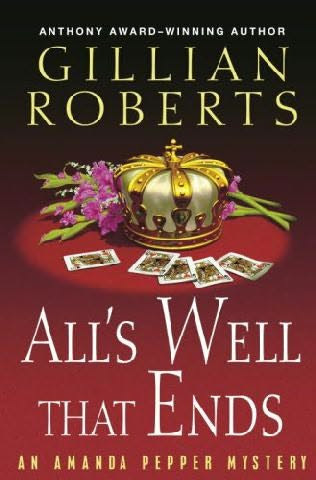 I'll be teaching with Gillian Roberts in a few weeks at the Book Passage Mystery Writers Conference (Rhys will be there, too!) - an we're giving a workshop on crafting a series. Who knows, maybe I'll return energized and there will be a series in my future. 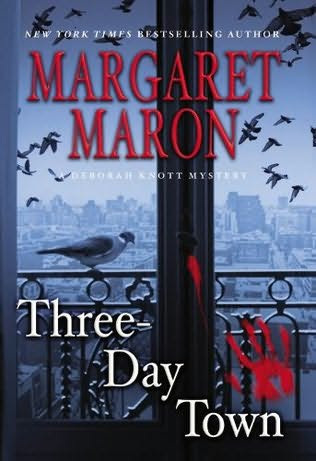 Reine, you will not be disappointed in the newest Three Pines story... finished it this morning at about 3 a.m. and then just lay awake thinking how beautiful the story was. Penny is transcendent! Finished Hank's incredibly suspenseful THE WRONG GIRL at 2 a.m. the day before. Thank heaven for vacation time and wonderful mysteries! But I do miss D.R. Meredith's John Lloyd Branson & Lydia Fairchild series. I miss Marne Kellogg Davis' Lilly Bennett series. 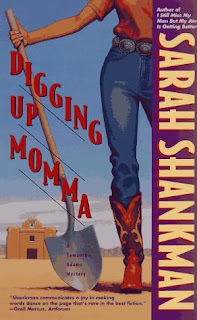 I miss pretty much everyone Charlaine Harris has decided to stop writing about, although I defend her right to do so! (sigh). I think Travis, like Colonel Primrose and Harriet Vane, had to exist when he did... I would hate for him to have been "updated" into our world of more sophisticated weaponry and digital gadgets. I'm glad they remain, rather perfectly, there. I miss the 87th Precinct and Matthew Hope. I miss everybody Lawrence Sanders wrote -- and the food! 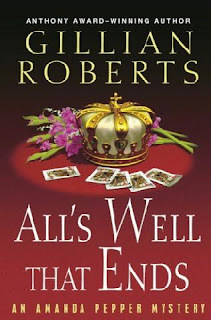 I must have gained a pound for every book -- whatever Archie or Edward X. was eating always sounded SO good! I miss Morse. Brady Coyne. Charlie Moon. Wouldn't more Lord Peter Wimsey be wonderful? Sigh. 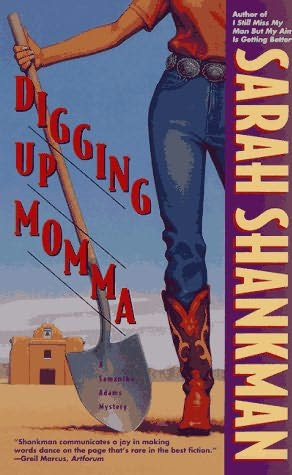 I loved Sarah Shankman's books! And Joan Hess's Maggody series, along the same vein. Charlaine Harris's other series--Aurora Teagarden, Harper Connelly, and Lily Bard "Shakespeare". They were all more appealing to me than the Sookie books. What about P.D. James's Inspector Dalgliesh series? I have not seen a new one in a long time. But Henry O is done? Sad, sad. I just knew you guys would remind me of yet more series I'm missing!!! Marne Kellogg Davis wrote another series, Kristi, only about five in the series - have you read any of those? I love that series! And yep, missing it. And oh boy, do I ever agree with you about the latest Louise Penny. I know I say this about each book, but I think "How the Light Gets In" is her best yet. Have not read Hank's The Wrong Girl yet . . .
Marjorie, I forgot Reed has one more Moe!! Yay! My "Moe Withdrawal" can now go on hold for a bit. And Mrs. Polifax! How could I forget her - which brings to mind the Miss Melville series. 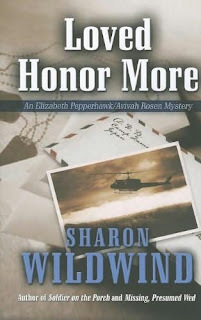 Carol, I'm glad to meet another Sharon Wildwind fan. She's an incredibly talented writer, I think, whose work is sadly underrated and under-discovered. Lucy/Roberta - your Dr. Rebecca Butterman is how I discovered you. And happy I did - I miss your Rebecca. I am ecstatic about so many out of print books becoming available as EBooks - more "new to me" authors to discover - Yay!!! Hallie - I have not read your Dr. Peter Zak books. My first "Hallie Experience" was "Never Tell A Lie" and you had a fan forever. Now, I need to try Dr. Zak. I'll second missing the Southern Sisters mysteries. I also miss Jimmie Ruth Evans' (Dean James) Wanda Culpepper books and (oh, so much) Barbara Neeley's Blanche books. Maybe I'll do some rereading. 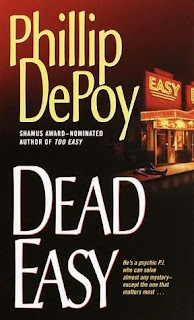 I lament the death of Reginald Hill and Tony Hillerman. Daziel and Pascoe and Chee and Leaphorn were my favorites. I miss Jill McGown's Inpector Hill and Judy ? series. I know I'm going to leave out some books if I try to list all the ones I miss. When an author I love decides to end a series I'm attached to, I feel like I must go into mourning! Some of you have already mentioned books I mourn for. It's even worse when the author dies because the characters die with them. I am eager to see what Tony Hillerman's daughter does with his series and what Blaize Clement's son does with hers. I am missing William Tappley and Philip Craig. Right after I started reading the Southern Sisters mysteries I found out that Anne George had died. I almost didn't bother to read the rest of the books in her series. If I discover a series author who is new to me when I'm at a library or bookstore, and I can tell that I would like the series, I won't read the books if I find out that the series has ended; it's too much like losing a loved one. I like to read series books, rather than stand-alones, because the characters I like DO continue. ALL of you JRW authors who no longer write a particular series: I miss your characters sooo much! I like what you've done since but I will NEVER stop missing your former series. Is Maggody over now? No!! And no more Amanda Pepper, no more Henrie O? No!! Oh, that' so interesting! And where do the characters go when they're..resting? People always ask me about Charlie McNally (thank you so much!) and I bet she'll be back. ANd , Yes, more Peter Wimsey..that would be lovely. I miss Kat Kajinski's Kat Colorado series a lot. Also Mary Willis Walker's Molly Cates' series. 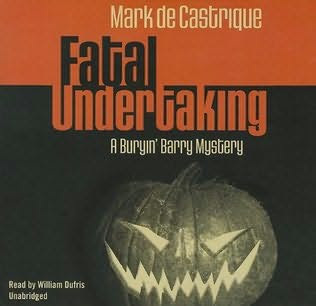 I think they got me into reading the mystery genre. This is interesting, I mentioned something like this in a lengthy post to DorothyL this morning. Series I miss include Hill and Lloyd by Jill McGown, a wonderful writer taken from us far too soon, as was Philip Craig who wrote the wonderful JW Jackson mysteries set on Martha's Vineyard. I loved Mrs. Pollifax and would adore learning that someone discovered another half dozen of her adventures waiting to be printed. I too loved Anne George's Southern Sisters, as well as Patricia Sprinkle's Maclaren Yarborough. The latter series ended neatly with a way to re-visit if the author were ever of a mind to do so. I miss the Hoagy and Lulu series by David Handler. I miss the Matthew Hope series by Ed McBain. I was never quite sure why he ended that series and continued the 87th Precinct. I liked it so much more. And finally, I really really miss John Putnam Thatcher, that clever collaboration of Mary Jane Latsis and Martha Henissart otherwise known as Emma Lathen. I was once sitting at a dinner at Malice Domestic with Kate Stine and Brian Skupin from Mystery Scene Magazine, and Brian asked this very question, Kaye. What series do you wish there were more of? And I said there was a series set in the South, one I loved, but I couldn't think what it was. It had fabulous dialogue. And then, several minutes later, I remembered and said, laughing, "Oh, it was the TV show Designing Women." Anyway, to answer with an actual book series, I miss Beth Saulnier's series about a newspaper reporter in upstate NY. I would have also said I missed Michael Kahn's Rachel Gold series, but a new one in that series just came out last month after a ten-year hiatus. Sometimes patience does pay off! Oh, and I miss S.W. Hubbard's police procedural series set in upstate NY, too. Three books were too few. Yes, John D. MacDonald was one of my early favorites--I read them all. Would be interesting to go back now and see if they stand the test of time. I miss Tim Cockey's Hitchcock Sewell series. Even just one more book would make me happy. And like Aubrey, I would have love to see the Mathew Hope books continue. Barb, you made me laugh! But oh boy - I do too miss DESIGNING WOMEN. A couple years ago, I treated myself to the first three or four seasons on DVD. It may be time for me to watch them again! And - there's a painting in my WHIMSEY that was prompted by the opening of season (oh, darn, I can't remember!) ??? - when all the women were dressed in white flowy dresses and big hats - remember? I loved that scene and it, obviously, stuck with me. And, like Lucy, the discussion got me thinking about another series I miss. I have no idea if there might be another (Fingers Crossed!) or not. There 12 years between the second and third books. It's Michael Malone's Cuddy and Justin series - anyone know anything about it?? Hank, thinking about good stopping points, it looks as though Sue Grafton is getting closer to the end of her herculean task of writing a book for every letter of the alphabet. And her books are all worth reading, too, which is amazing. I bet she's looking forward to Z by now! I also miss the Kat Kajinski's Kat Colorado series, as well as many mentioned here! Some others that I don't know if they stand up to the test of time but when I was an early teen I found Brett Halliday and the Michael Shayne mysteries, loved those books. Nero Wolff, of course, and Ellery Queen -- loved those books! So many books already mentioned, so I'm segueing over to the telly. I am already missing LEWIS. It felt like loosing good friends. What will Lewis and Hathaway be doing in their screenless live? I miss Morse. I miss Dalziel and Pascoe. I miss Buffy the Vampire Slayer. And Firefly. And Torchwood. And maybe most of all, Fox Mulder and Dana Scully. I was always sorry Agatha Christie didn't write more Tuppence and Tommy mysteries. I recently re-read the 1st one and it still charms. Oh, and Morse, of course! and Arianna Franklin's Mistress of the Art of Death mysteries. 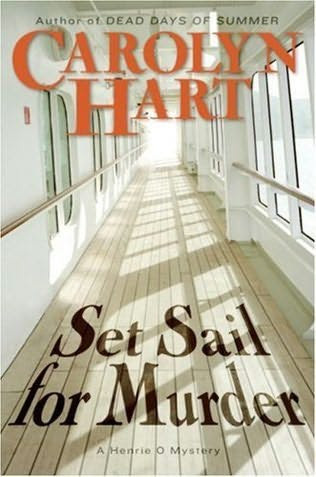 Both series were cut short by the authors' untimely deaths. The Franklin series ended on quite a cliff hanger that will I suppose never be resolved. I miss Sue Hubbard's Adirondack series with Sheriff Frank and crew. I also miss Roberta's Cassie Burdette golfer series and Hank's Charlie McNally. In my imagination, they're still out there, doing what they do, like Tony Soprano is still hosting cookouts and may even be a grandpa. Or House and Wilson are photobombing tourists at Mount Rushmore before racing away on their bikes. Deb, you might miss Lewis, but tonight starts the new episodes of ENDEAVOUR on PBS! Hurrah for that. For anyone who didn't see last year's one episode, these are the adventures of the young Lewis just as he is learning his craft as a copper. OH, Marjorie, I LOVE Endeavour! I really think last's years episode was perfectly done.. I loved seeing others mentioned three of my favorites - Simpson's Luke Thanet, Jill McGown's Hill and Lloyd, and Dexter's Inspector Morse, and would also add John Harvey's Charlie Resnick!! I miss Robert B. Parker 's Spencer . He is the one who brought me to the fabulous mysteries' world. I miss Elizabeth George 's Lynley and Barbara too. I miss Arianna Franklin's Mistress of the Art of Death series. Sadly, with only four books in the series, Franklin passed away. The books are medieval mysteries featuring a female physician, Adelia, who was educated in Italy and then sent to England in the role of a forensics expert. OH! I miss those early "Cat Who" mysteries! Rhonda, I understand exactly what you mean about being attached to characters. When the Cassie Burdette series was cut, I wrote an essay called CHARACTER ASSASSINATION. But it was so sad, no one would publish it:). Yes to Susan Hubbard's Adirondack mysteries--I loved Frank Bennett. And I desperately miss the characters on FRIDAY NIGHT LIGHTS. If you never got hooked on that TV show, go immediately to your netflix queue and load the first season. It IS NOT all about football! Is it okay for me to think Charlie McNally might be back? Please?? ?Sometimes I'm afraid to get too attached to Jane and Jake! My paperback copy of The Other Woman arrived yesterday, and I intend to reread it before reading The Wrong Girl. Roberta, I loved both of your earlier series. 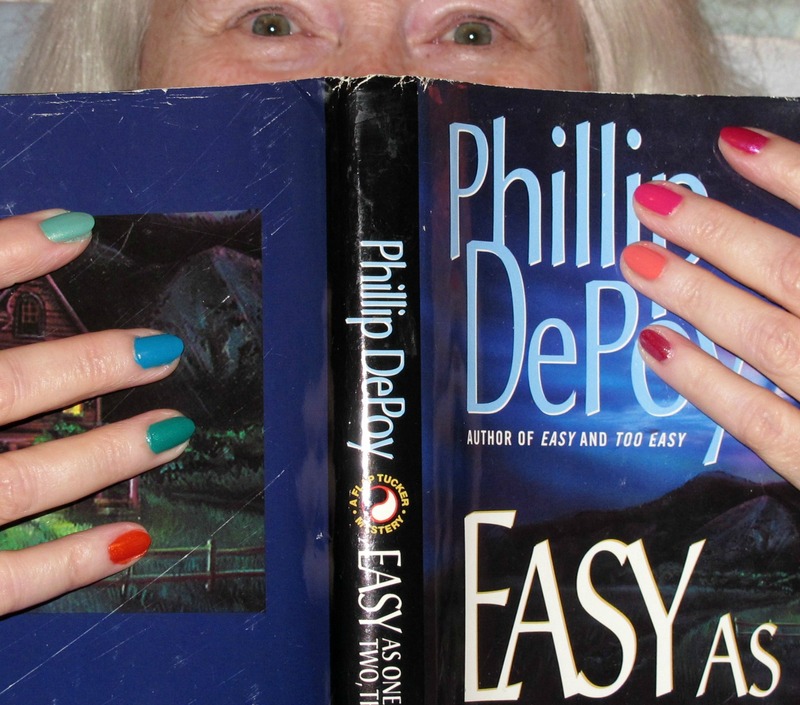 The Key West mysteries are delightful, too. I hope you will be giving them to us for a long time! The Hilary Tamar series by Sarah Caudwell. I loved that you never knew if Hilary was a male or a female...it never mattered to the story. Alan Grant by Josephine Tey. Kellen Stewart by Manda Scott. Rebecca Butterman bu Roberta Isleib/ Lucy Burdette. Jonathan Argyll by Iaian Pears. Salome Waterhouse by Denise Osburne. Simon Kirby-Jones by Dean James. I'd almost forgotten how much I missed Iain Pears's Jonathan Argyll till a minute ago! I let the last books by Reginald Hill and Ed McBain sit on my night table for months and months - I just couldn't bear to say goodbye. But I'm just about to start Hallie's Zak series for my book group - and now I'll have to them not to get too attached! I also hope that there's a lost Ariana Franklin manuscript that might surface sometime. I miss Janet Neel's Francesca Wilson and John McLeish novels, a great combination of music, business, and policing. As long as I'm wishing, another Loretta Lawson novel by Joan Smith wouldn't go amiss. This has been fun - thanks, everyone! !